Come and discover our gite "La Grappe de Raisin" located in the historic center of Ribeauvillé, at the foot of the Three Castles. 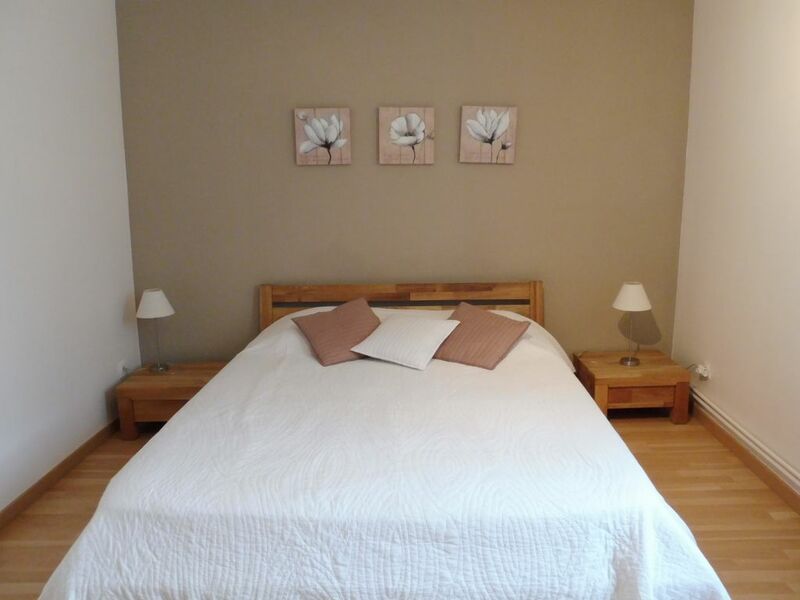 This is a charming apartment, nestled in an Alsatian house from 1900, completely renovated, furnished and decorated by us to make your stay in Alsace as pleasant as possible. You will be located in a very quiet dead end, near the shops and restaurants of the historic center. Public parking is less than 50 m away. Others are easily accessible in a short time. This three-room apartment of 75 m2 is equipped to accommodate 4 people ideally with a bedroom with a large double bed (160x200), a bedroom with two single beds (possibility to bring them together for a couple). The sofa of the living room is convertible and can accommodate 2 additional people. For the little ones, it is possible to provide an umbrella bed and a booster seat. We offer housekeeping and provide optional sheets and towels for 8 € and 5 € per person (dry cleaning fee). The living area includes a large table with 6 chairs, a sofa bed, a coffee table and a flat screen TV 82 cm. A DVD player and some DVDs are also available. For your comfort, you will find available a fully equipped kitchen (oven, hotplates, dishwasher, refrigerator, microwave, coffee maker, kettle, toaster, dishes and utensils, etc. ), as well as a washing machine and the necessary small household appliances (vacuum cleaner, iron, etc.). You can enjoy at leisure the free Wi-Fi connection. Board games, books and tour guides are planned. It is impossible to resist the charm of Ribeauvillé and its region which offer, in all seasons, a great variety of landscapes, activities and animations. Ribeauvillé is famous for its Christmas market, its medieval festival (Pfifferdaj) and its celebrations to the glory of Bacchus. While enjoying the tranquility of Ribeauvillé, you will be in the heart of the sites of Alsace, such as Riquewihr, Colmar, Eguisheim, the Castle of Haut-Koenigsbourg and many others within a radius of 30 km. Let yourself be surprised by the local gastronomic specialties and, of course, the Alsace wines that are famous in the region. Accueil fort sympathique et assistance parfaite. Appartement joli et fonctionnel, en haut de la rue principale, le parking gratuit vraiment tout proche par un agréable sentier est très appréciable, propriétaire très sympathique. Gite agréable, bien situé, spacieux. Très bonne adresse. Nous avons apprécié l'accueil des propriétaires, la situation du gîte et la région en général. A refaire ! Très beau gite bien aménagé. Spacieux et fonctionnel. Calme et à proximité du centre-ville. Je recommande ce gîte.